From LA to NY…LANY's music covers this wide expanse with their distinct sound that cross the borders of pop, rnb, chillout, and everything in between. Their fresh, lilting sound lurking among the corners of obscure indie pop turned into a national obsession. As devoted fans are singing along to the lyrics of ILYSB, there is that pained longing to see them live! Yes, they love to catch them live in concert so bad! 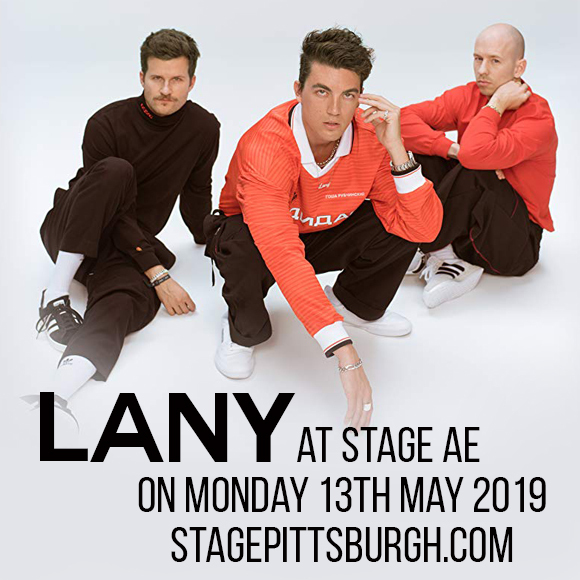 Without a doubt, news about Lany's upcoming show here at the Stage AE on Monday 13th May 2019, is something they won't take sitting down. LANY fans are quickly acting on this opportunity to get the best seats in the house. Well, keep up the pace and get your fingers on the move — click 'buy tickets' now! LANY, (pronounced Lay-Nee ) are stuff that indie-pop dreams are made of. Sometime in 2014, friends and founding members Paul Klein on vocals, keyboard and guitar, Jake Goss on drums, and Les Priest on keyboard, guitar and vocals, started creating music from the confines of their bedrooms. They started releasing music online –“Hot Lights” and “Walk Away”, without revealing their identities or officially naming the band. Sometime later, they started using the name LANY and released the singles “Made in Hollywood” and “Bad, Bad, Bad”. Great music has its way of finding itself appealing to the tastes of the online music community. Soon afterwards, LANY were out of their bedrooms and thrown into a big stage with wild crowds at their feet. They were a staple at major festivals like Bonnaroo, Sasquatch and Firefly, and started headlining tours around Europe, the United States, Canada, and some parts of Asia. LANY – an acronym that signifies their aspirations for their music to cover “somewhere between LA and NY,” has definitely achieved success in leaps and bounds. Audiences are obsessed with their refreshing sound that puts a spotlight on a wide range of emotions. In their live shows, expect fans to be singing along, not missing a beat, and singing their heart out to every word of their biggest hits — "Good Girls", "The Breakup", "It Was Love", "ILYSB", "Super Far", and even to songs from their latest album "Malibu Nights". You wouldn't want to miss all the fun, do you? Nothing left to do but to go and grab your tickets now!